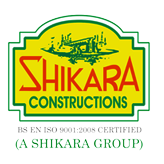 Shikara Constructions Pvt. Ltd. A Group Of Nukem Hotels & Resorts Pvt. Ltd. Shikara Restaurant, The First Three Star Hotel Of Navi Mumbai In 18 Years, Is A Pioneer Name In The Field Of Hospitality.It Is Defined As Faith Confined In Human Potential, For Creating Brilliant Structures For Better Living. Since 8 Years, The Group Has Been Consistently Exploring New Avenues In Real Estate. We As An Organization, Have Always Focused On Teamwork As The Major Factor For Creating Wonders In Whatever We Do. Our Team Is A Fine Collection Of Synergised, Efficient And Quality Driven People With Their Own Area Of Expertise. Based On This, We Have Always Met Head-On With New Challenges Coming Our Ways. Positivism, Energy And Courage Is What Characterizes The Group With A Spectrum. We Boast Of Thoughtful Creation Coupled With Anunending Drive For Quality And Assurance. Shikara Constructions Promises To Sail You To Your Dream Home.